“Or you can come on the ride with me,” I answer when I see Kayla’s brow furrow at my request to help babysit Brenna while I ride for a few hours. I wasn’t expecting that. She seems sincere but it is quite different from the usual response to ride invitations, rolled eyes and long sighs. I pause a moment to consider whether she might be sarcastic. Still okay. I guess she’s serious. The novelty is kind of exciting. I need to reconfigure the bike for a passenger! My oldest daughter, Laura, recently turned eighteen. Last night was her senior prom. She rode away from our house in a long, white limousine with a group of friends. She was beautiful. I can measure Laura’s age in motorcycles: two. The one she sat on with me as a toddler, once she overcame her fear of the noise, still seems like a recent purchase. Yet in a few short months, she’ll be off to college. I’d like to get on some adventures with her—maybe sing her the bumblebee song one more time—but today she tells me she is tired from the prom and just wants to lay low. I am excited that Kayla, three years younger, wants to join me. She hasn’t cared as much for adventuring. I’m anxious to ensure a fun ride so I don’t justify her usual ambivalence. We will follow the loop I’ve already planned, to Swan Falls, Bruneau and back. The GPS directs us along a succession of orthogonal asphalt roads. There is almost no traffic and we set our pace accordingly. Kayla leans on the bag behind her and we watch long tracts of sagebrush with oases of disheveled homes and out-buildings whiz by. The short access road ends at a rocky trail that spirals up around the butte. Ten yards up the trail, a dad in riding gear is helping turn around two little ATVs for children led beyond their abilities (probably not legal a few miles west¹). “I can see why kids die on ATVs,” I remark through the intercom. We wait. “You just rode that right up, huh?” a man comments from the platform as we pull to a stop at the summit. “Better than falling,” I answer with a smile. Kayla is comfortably unaware of trail challenges. I think it’s best to keep it that way. “Would you like me to take your picture?” a twenty-something woman asks, noticing the camera I’ve pulled from the tank bag. Such friendly people. We begin a back-and-forth exchange about focusing (“Do you see the dot in the viewfinder?”) that culminates in a blurry photograph. I am relieved when Kayla expresses mild approval. “This is kinda cool,” or something like that. She climbs the stairs to the platform and pauses to take in the view—white mountains on the southern and northern horizons, the Snake River Canyon nearby. The friendly people and their dog have gone. There at the rail of the small platform, raised high above the plain, it’s as if we are sailors looking round from atop the mast of a wooden ship, wind in our faces as we ply an empty sagebrush sea. We hear the echo of gunfire originating with trucks parked at the base of an adjacent hill—here in the “NO SHOOTING” area where kids ride around on ATVs. Oh, Idaho. “I guess we won’t ride over there,” I say, nodding to the trails in that direction. I notice I have phone reception so I leave my wife Jessica a message to let her know how we’re doing. “Kayla found some yellow underwear she plans to keep,” I jest. “My lips are going numb,” I notice as we’re walking across the dam. And I’m serious. It’s like I’ve come from the dentist. Mosquitoes swarmed while we were parking down here so I pulled a little DEET from the tail bag, sprayed my arms, closed my eyes and sprayed my face. I guess that’s not how to do it. “Probably not good,” Kayla answers with a little laugh. Horns above begin to wail insistently as we’re returning across the dam. We look around. Whatever is happening is not apparent so we continue on. From the dam we ride back to the rim and turn from blacktop to trail, stretched flat and unwavering before us. Whatever used to be here was erased eons ago as the land slid slowly across the great geological furnace that now powers Yellowstone’s geysers. The massive Bonneville Flood razed whatever remained.¹ I glance in the mirror and see dust billow behind as we sweep across millennia. “If we start to fall over, do your best to jump clear,” I instruct Kayla. “We won’t be going fast.” We’ve turned onto an ATV track that descends back to the river. Tightly curved and canted, crossing little rubble fields, it makes me think of a waterslide. We cross another patch in similar fashion before the river returns to view. “Looks like easy trail the rest of the way,” I observe with relief. I like GS challenges in small doses. Cattails and Russian Olive trees crowd the shore around the simple campsite we’ve selected for a break. Kayla stands apart for a moment, finishing a granola bar, looking across the water. The year has given her a lot to think about. When Native Americans gave the sign for this river, a curve of the hands meaning “salmon,” pioneers saw the sign of a snake. The misunderstanding became permanent. Kayla is at the age when much can seem unfair and adults unsympathetic. It is easy to misunderstand. My hope is that she will enjoy the tranquility of these natural spaces, away from phones and fashions. I am glad she seems content with the trip so far. We walk a moment around the site to see what we might find—just a duck blind—until we’re rediscovered by mosquitoes. They aren’t vicious but annoying enough to motivate us onward. The trail casually curves and climbs, up and down, along the river. Several peculiar rock formations merit comment as we pass. Trees, shrubs and grasses are invigorated by the returning sun. “I just saw the year’s first butterfly!” I exclaim when I see delicate wings flutter from the trail. The canyon widens and the Owyhee Mountains come fully into view as we ride into an area where earth moved into mounds and berms, and posts without purpose, signify some past industry. The map suggests there was once a ferry crossing here called Clark’s Ferry. Now largely desolate, this region along the Snake River has a storied past. In 1863, Boise mines drew between 25,000 and 30,000 to southern Idaho … The overland immigration from the east in 1865 was also large, 1,840 wagons passing Fort Kearny in May; and though the comers distributed themselves over the whole coast, Idaho and Montana retained the greater portion of them. Howluck quickly became a character of legend. He “was a large, tall man distinguished mostly for his oversize 14¾ inch foot. By 1866 the whites (generally unaware of any Indian name for their adversary) were calling him Bigfoot.”² Even after Howluck quit the fight, others used over-sized moccasins to leave tracks that would intimidate settlers. As we continue to the town of Grand View, Kayla and I should cross a gravel bar named for the giant native, Big Foot Bar. What Howluck did there in particular, I don’t know. The trail is wide and well traveled and I expect we’ll make good time. “Woah, the road just ended. That’s weird,” I announce with dismay as we’re suddenly forced to a stop at a small riverside campsite. There is nothing but brush and the river ahead of us. I must have missed a turn. I study our surroundings but find no alternative other than a steep side trail up the edge of the canyon. As much as I hate it, we’ll have to backtrack to something else. We won’t see Big Foot today. 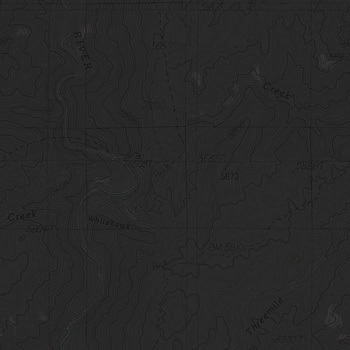 The GPS shows a path not far behind that should take us to the rim above the canyon and around the impasse. We turn back. Morning rain has left occasional, parallel puddles on the dirt road. I’ve taken care to steer clear of the mud but now I’m in a hurry and aim to balance between ruts. The decision takes a split second, only slightly longer than it takes the front wheel to go sideways and us to fall with a splash. The boxer engine, as usual, keeps us from going fully horizontal. And I had slowed down to thread between puddles so we are able to react and land on our feet. The only harm is it our clothes as we’re left standing in sticky mud. I look at Kayla to make sure she’s okay. I see her flexing her right hand. “You alright?” I ask. “Yeah,” she answers in a relaxed tone. Do I detect amusement? She steps out of the mud and watches while I struggle to right the motorcycle by doing a funny mud dance. The pig really wants to wallow. “I’ll steer far away from anymore puddles,” I promise as Kayla wipes mud from her pants and shoes. “I think I’ll get off,” Kayla answers slowly, as if to help my obviously diminished comprehension. I blip the throttle and, for just a moment … well, pigs do fly. Kayla makes a sound that I take to signify admiration, though I suppose it could mean other things as well. The route we find out of the canyon climbs casually by car-sized rocks that look like raisins. Up close, their skin is wrinkled by mortar lines that hold thousands of smaller rocks together. This alternate route doesn’t seem so bad. After a couple GPS checks, we are onto an old powerline maintenance road. The line is gone but the weathered poles remain, some intact, some cut short, each standing solemnly. It should be a straight shot to Grand View through the Birds of Prey area. I expect each rise to reveal the final stretch into town. Instead, we are “experiencing the area on its own terms.” We see only the dusty, rutted, and at times overgrown, road continuing to the next horizon. At the next rise, it’s the same. I feel impatient, not for myself as much as for Kayla. I wanted to make this a pleasant ride but we’ve followed this straight line across the plain for more than an hour now. Will she end up hating the whole thing? The “dense concentrations of nesting birds of prey” are notably absent. We’ve seen two birds with curiously long beaks, perhaps Wilson’s Snipes,¹ but nothing else. Whether this road will ever end starts to become a joke. “Just over the next rise,” I propose excitedly. Delusion begins to set in. I mistake a distant fence line for the highway. “I think that’s it!” But it isn’t and we drone on. When finally the real highway scrolls into view on the GPS, Kayla remains skeptical. “The GPS wouldn’t lie,” I assure her. “Shall we stop at a restaurant?” I ask Kayla as we speed along the highway into Grand View. It is almost six o’clock. We’ve been riding for more than four hours. I’m hungry but more than anything, I feel like I need to make it up to Kayla for the unplanned desert monotony. “A burger sounds really good,” she answers. “Yeah, to me too.” We’ve had granola bars and water, and plenty remains, but sitting down to hot food sounds about perfect. We look left and right for a restaurant as we roll across the bridge into town. Nothing. We don’t even see any people. At the intersection with Highway 78 on the other end of town, we notice the Y Bar & Cafe but the cafe is dark. “Where should we go if we want a hamburger or something?” I ask the lady attending the adjacent gas station. I’m a little concerned when she has to think a moment. From this direction I remember where the first reservoir turn will be. “At the school?” I ask. “Black Sands Resort” sounds a little fancy. I don’t want to commit to a drawn out, expensive dinner but we don’t seem to have a choice. Seeing the squat building as we pull into the gravel lot along the reservoir, miles down the highway, puts that concern to rest. This looks just right. “Go ahead and find a seat,” I tell Kayla as I’m hanging our helmets and stacking jackets at the motorcycle. When I enter a minute later, Kayla is the only one of about four people in the whole place sitting apart from the bar. I know the food will be good when the unsmiling, heavyset waitress brings fry sauce standard with the ketchup and mustard. “Let me tell you what you missed,” I begin after Kayla returns from a minute in the restroom. She laughs as I catch her up on the details. Rather than another town and historic site, as planned, we are going home from here. The Birds of Prey area wore us down. The last light of day breaks into rays through heavy clouds above the Owyhees as we cross by the C.J. Strike Dam at the end of the reservoir. We both remark at the beauty of the scene laid wide before us. A herd of antelope dart away as we approach rapidly on one of the gravel roads across the military practice range south of Boise. “Woah,” Kayla exclaims a minute later when we miss a badger waddling across the road by inches. It seems all the riffraff have come out to see the day end. The sky remains spectacular as we rocket toward home. I think the ride has come out alright.